:It was a warning. Back off. Stop helping the addicts. Stop undercutting demand. He had believed they would be protected. But they took her - the girl in the raspberry beret - and by the time they were done he was broken. So David Hidalgo flees Spain for his native Edinburgh. Now he must work out how to live again and lead others when his faith has been ripped away and all that's left is doubt. In Edinburgh David finds friendship, disturbing and unlooked for romance, and respite from the pain. That is, until a young girl is abducted and it becomes clear that it's not so easy to leave the past, or danger, behind. David knows he must set aside his doubts and act. But what will the cost be this time? 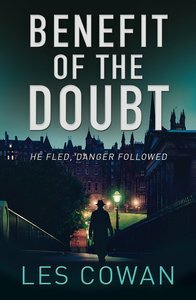 About "Benefit of the Doubt: He Fled, Danger Followed"